Hi! So, 0.4.5 is getting pretty close to being completed. I’ve finished the first round of performance improvements, and I think you will all be happy with the results. I’m tuning the game around the expectation of people using less than 70 parts. That being said, I still don’t want to restrict people from using more, I just can’t guarantee performance for larger designs. My buddy Matt has been slaving away on the updater, and it’s looking great! I’ll try and post a screenshot soon. I started working on a few new levels for 0.4.5, while the updater is still being finished, and I decided to implement something I’ve been wanting to do for quite some time…. Checkpoints. 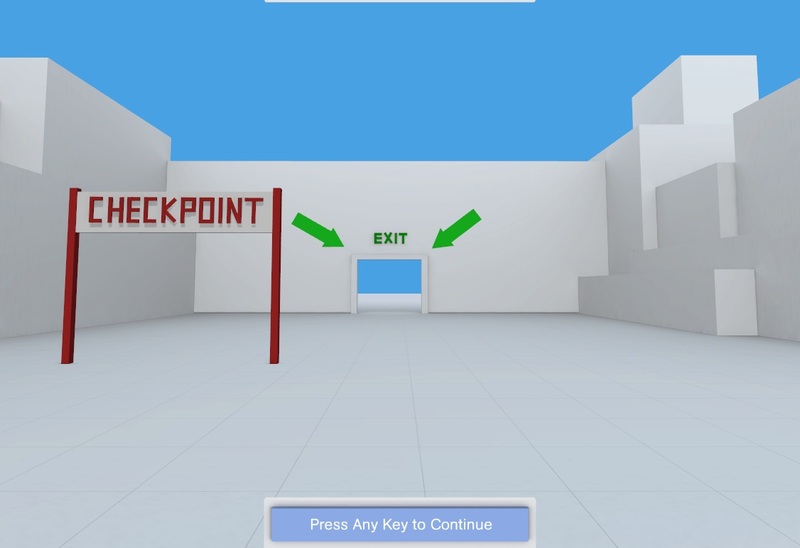 This will allow me to create more open levels that will require you to pass through each checkpoint and the finish line to successfully finish a given level. Here’s a quick screenshot of a simple example. I should hopefully have 0.4.5 out in a few days! 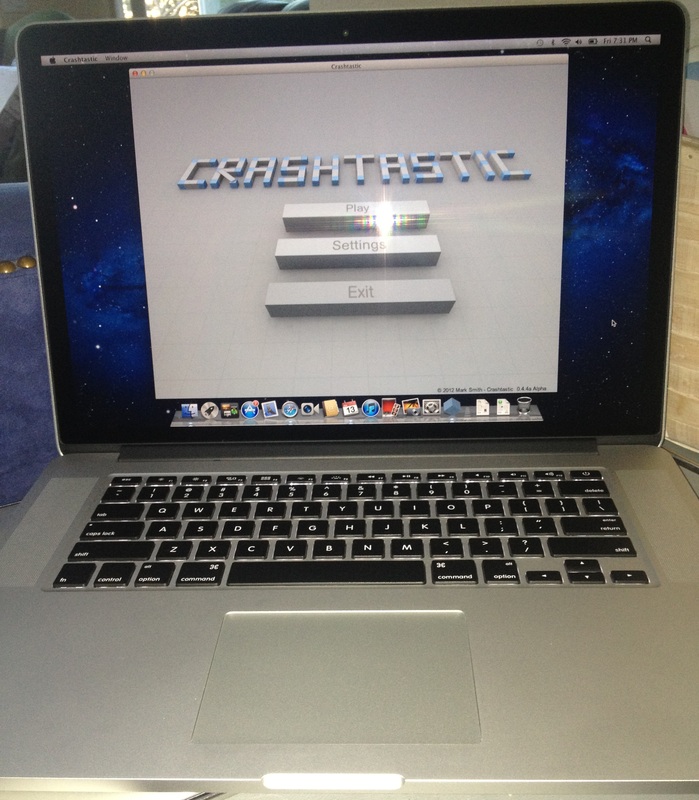 Crashtastic Mac Version Now Available! Many of you have waited patiently, so I am happy to announce that the Mac version is finally available! While working on the Mac port, I noticed a few general issues I wanted to patch before 0.4.5, so here it is. The Mac version is not quite ready, but it will be available soon! Fixed issue where when in Save menu using keys bound to the piece hotkeys would keep designs from saving. 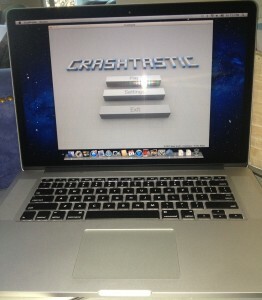 Here’s the first image of Crashtastic running on the Mac. Thanks to Unity, it’s seems to be running pretty well. A few things I need to fix before I release it, but it will be available soon! What’s next with Crashtastic 0.4.5? It’s been a while since I’ve posted an update, so I wanted to share a bit about what I am working on for 0.4.5. As I mentioned before I am following a pattern of alternating each update between fixing bugs and adding new content to the game. The last update 0.4.4 was a larger content update (controllable rockets and some new levels), so 0.4.5 will be more of a bug fix patch. The big thing I am working on for this patch is performance. I’ve gotten quite a few questions about performance, and it’s past time for me to do an optimization pass on the game. I did some quick queries of the database, and it looks like the current average number of pieces per design is…..
That actually surprised me quite a bit. I honestly expected it to be in the 30’s or 40’s! Without a doubt, the biggest challenge to performance for Crashtastic is the CPU performance of the physics simulation. Due to the fact that all pieces are jointed together, it takes a signifigant amount of computational power to simulate stable joints. Of course the more pieces you use, the worse the performance gets. I’ve done some initial testing with a few improvements, and I am already pleased with the results. I do want to give fair warning that the simulation results for designs in 0.4.5 will be different that those of 0.4.4. So some of your designs might not work as well as before. I’m hoping that this will be the last time I have to make these types of changes. I’m also looking at adding drag. I had disabled drag originally due to performance concerns, but I’ve got some things I am considering adding in the future that really won’t work well with infinite acceleration. Another item I am hoping will be ready for the 0.4.5 update is an actual Game Launcher and auto updater!!!! My buddy Matt is helping me out with this, which is greatly appreciated. I think he finally had enough of downloading 40 Meg zip files every time I patch! 😛 This will make updating the game easier for everyone in the long run. Those are the big items, but I may sneak a level or two in the game as well. The last thing I will add is that I plan on increasing the price of Crashtastic to $9.99 after 0.4.5 is released. I appreciate all of you early adopters as you have helped me nail down many many bugs and issues!! Tell your friends if they are on the fence to order soon, because it won’t be $7.99 for long. This is a very small patch to help fix an issue a few people are seeing with the game crashing at the login screen. -Fix for possible crash when trying to login. Just Press Start posted an interview a give with Jeff a few days back about Crashtastic and some of my thoughts on the design of the game. The server migration is complete, and we are back in business! Hi! Unfortunately, the server hosting the Crashtastic’s database is down for maintenance. While you should be able to login and play the game without issue, your records will not be saved, nor will you be able to load your existing designs. I don’t have an ETA on when the migration to a new server will be complete. This also means if you are trying to purchase the game, you will not be able to, until the database server comes back online. The good news is that when the server is back online, it will be faster than before. In addition, I will be evaluating a plan to enable redundance, so we can hopefully avoid issues like this in the future. Anyhow, the situation is resolved now, so everything should be good to go.